Casual weekend combo from visiting my parents yesterday. 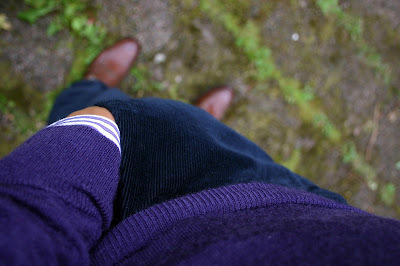 I'm starting to fall in love with these corduroy trousers. The button-down shirt is from Brooks Brothers and the knit a simple 20 euro piece from H&amp;M. Usually it's pretty hard to find sweaters with a slimmer fit, but their stuff is just right. The quality isn't anything too special, but you cannot ask miracles for their prices. The fit in these trousers is just perfect, and the fabric is very soft. I love my penny loafers as a part of fall clothing, they just bring that hint of preppyness that I really like in my fall clothing. The socks are from Pantherella, and the purple heel is a nice touch here I think.